Can anyone tell what type of instrumention is better/reliable to use with the Rotax 185 for RPM-Temp, also which is the better pull start to replace the originals ? Any help with starting a motor that has not been started for a looong time would be good also. Looking at your starters, you actually have the most current pull starters which have proven to be very reliable. As for the RPM/Temp, a few have done the temp thing, but most don't worry about it on the 185's. As for the RPM, many don't have tach's. In fact I flew my first Lazair (A-686) for 12+ years without tachs. You develope a good ear for syncing the engines, but ultimately don't have a good ear if an engine is developing a slight problem without the tach. This is what I'm using, and other have variations of tach's on their planes. why would you want to run both engines on a test stand at the same time? especially if they were directing prop blast AT each other? that would seriously affect tuning as the prop load would not be representative of the normal static condition. i am an EGT convert though - i wouldn't even attempt to tune an unfamiliar engine without an EGT probe and gauge. it quickly shows you how close you are to the "sweet spot" when tuning and keeps you away from potentially damaging temperatures by running it too lean. just because the engine RPM peaks at a certain point, you could be running your engine too hot if you don't richen it up enough after finding that peak. The EGT was invaluable in JPX tuning. If they have an assembly/maitinance manual I will get 2 just in case anyone else wants one. As to running two engines at the same time I thought the fact that I stated that the engines would need to be on [/B]OPPOSING (not opposite) sides to get the pull starter would mean side by side not back to back, I can see how this would confuse people when reading. Opposing means in there standard configuration attached to the wing the pull starts need to 'run' towards each other, thereby on a stand the motors would need to be revesed or opposing each other to allow acsess to the pull starters, hope that clears that up for you. refer to the pic to see how the motors would be aligned. 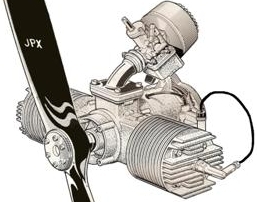 I have a PDF download of the Rotax maitinance manual. if you want it here it is. Took the girls out for a test run on the new twin side by side test stand today, one 185 ran lovely and the other refused to start, I'll have a look at the power supply as no spark was available ? bugger thats a remove the nancelle job, I will try to get a pic soon.